Communication and Safety In Relationships from Paul on Vimeo. Our romantic relationships are an important part of our lives – probably more important than our business relationships. Because of this, I’m dedicating this post to how to be an effective communicator in your romantic relationship as well as your business relationship. In the next few minutes, I’m going to show you how to create safety in communication which becomes the basis for intimacy and give you ten quick relationship rules that you can apply to any relationship whether it is personal or business. 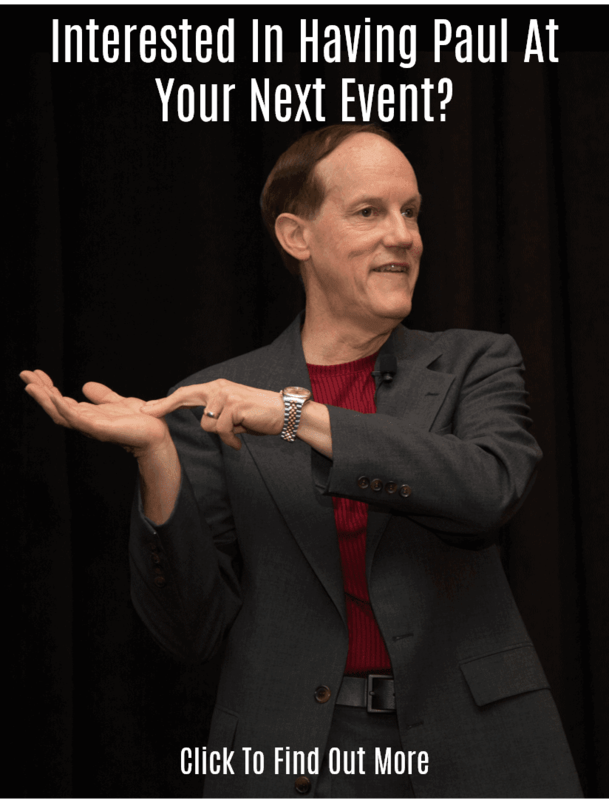 All of my consulting, workshops, and speaking are centered around effective communication in business, but inevitably someone will approach me at an event with a relationship communication problem. The conversation usually starts with “Can I ask you a question?” and I can tell that it is going to be a personal question because I can see the emotion in their body language. Safety in communication is the free and open exchange of ideas. When you have safety in communication you can say anything and there won’t be a negative response or pushback. Unfortunately, almost all relationships have developed what I call “landmines” over the years. These landmines are things you know you don’t want to say because you are certain to get a negative reaction. Safety is a lack of landmines in a relationship. In a safe communication environment each person is free to maintain their own identity while seeking to understand the other person. While the second dynamic of effective communication is “it’s not about you”, this doesn’t mean that you sacrifice who you really are – it means that you adapt yourself to the other person as much as possible while maintaining your identity. Later in this post, I’ll show you exactly how to create safety in any relationship. So, let’s follow the Path to Intimacy and dig into this a little bit deeper to see exactly how the process works. The first step in the path to intimacy is creating safety which leads to open communication and open communication creates intimacy. This happens because once you have safety you can say anything to your partner without fear of retribution. Once the fear is gone, intimacy will take its place and everything else you want in a relationship will flow from that. This simple formula will supercharge your relationship because when two people are free to be their true selves and can say anything to each other, intimacy will be the result. Because I’m a computer programmer and software company founder, I tend to look at human interactions and communication in digital terms, so I created this graph to illustrate the path to intimacy. Some readers will appreciate this more than others! When you look at the graph, you will see that as safety increases there is a point where intimacy starts to increase exponentially. If the bottom off the graph is a scale of 1 to 10, when you reach seven or eight, intimacy starts to grow exponentially. The idea is simple: You say something to somebody and you evaluate their reaction. If you get a neutral or positive reaction, it increases safety. If you get a negative reaction, it decreases safety. When the reaction is positive you become willing to take another communication risk and over a period of time the level of safety increases as more risks are taken and rewarded. Over time, this simple process will build safety and trust along with open communication and intimacy. The length of time this process will take is different for every relationship. For some people it might happen quickly, for others it might take months or even years. One thing is certain: As long as you maintain safety at every step, you will get the result you want. You can’t rush the process, just let it proceed at it’s natural pace and you will be rewarded. While it can take a long time to build safety, safety can be destroyed instantly with a negative reaction. Perhaps you and your partner have worked hard to use the process of testing and proving to build safety in your relationship, but one of you says something and the other person has a negative reaction. Depending upon the level of safety and the overall condition of your relationship safety can be instantly destroyed and you drop back from a level 6 or 7 to a level 1, 2, or 3. Here are agreements that you can use to build safety and intimacy in your relationship. My suggestion is that you and your partner download the Relationship Agreement, read it, commit to the agreements, and sign it. #1 I will treat the other person the way that I would like to be treated. This is an age-old principle that is still valid. Frequently called the “golden rule”, it’s simple and it works as the foundation of any relationship. #2 I will listen with the intent to understand what is being said and acknowledging that what the other person is saying is important to them whether I think it should be or not. Our natural tendency is to evaluate what the other person is saying through the lens of our own perspective. When you apply this rule, you seek to evaluate what they are saying by working to understand their perspective. Be careful here: it’s easy to give a negative reaction and compromise safety when someone says something you instinctively disagree with. #3 I will always speak calmly and respectfully without profanity or sarcasm. Negative voice tones and body language can destroy safety as fast as negative words so remember that it’s not just what you say… it’s also how you say it. #4 I will readily admit my own mistakes and seek to correct them. This agreement means that you have to be as objective as possible when someone suggests that you have made a mistake or can improve in some way. Our natural tendency is to react defensively, but I’m going to encourage you to take a step back and evaluate the issue from the perspective of the other person and seek to correct the mistake if possible. This doesn’t mean that you have to admit to a mistake if you genuinely believe that you haven’t made one, just that you need to be as objective and flexible as possible. #5 I will acknowledge that the other person is right from their perspective and seek to understand their perspective even if I disagree with them. Everybody filters events through their own perspective. You know from experience that two people can experience the exact same event and come away with two completely different meanings. When you use this agreement, you will seek to understand the perspective of the other person and when you do, safety will be increased. #6 I will be curious, not defensive. Be curious and ask the question “why is he or she reacting that way?” rather than becoming critical or defensive. #7 I will ask questions to clarify what the other person is saying. Use reflective listening. Draw your partner out to make sure that you understand the idea that they are trying to transmit to you rather than what you think about what you think they are saying. #8 I will never say anything about the other person to someone else that I would not say to their face. Many times, this is simply gossip, but it also includes telling your mother-in-law, your father-in-law, or your friends something negative about that person that you wouldn’t say to them even if it’s true. This is important because when you verbalize it, it is reinforced in your unconscious mind. My simple recommendation is that you never say anything negative about the other person that you wouldn’t say to their face. Ever. #9 I will accept that the other person’s feelings and emotions are valid for them. Do this even if you don’t think they should be angry, happy, sad, upset, depress, frustrated whatever the emotion is. If they have an emotion, it’s valid for them. Never tell someone that they shouldn’t feel the way they feel. They do feel that way, and for them it’s valid whether you think it should be or not. Invalidating an emotion is a quick way to destroy trust, safety, and intimacy. #10 I will seek to understand more than I will seek to be understood. When you do this, your partner is likely to seek to understand you and this will create a positive cycle where safety and intimacy quickly increase. Sometimes existing communication and relationship patterns have already damaged or destroyed the safety in a relationship. The best way to rebuild damaged communication patterns is for you to set your intention and commit to using these ten agreements to improve the relationship. Use them yourself even if your partner won’t. The only person you can control is yourself – you simply can’t control what the other person will do. This is good news because it moves you to a position of hope. When you adopt these ten agreements and your partner sees that you are making the commitment, they are likely to respond in a positive way and begin to support the agreements on their own. My second suggestion is to take a risk and talk about the agreements and safety now even if your relationship is currently difficult. Be soft. Don’t accuse or assign blame. Don’t begin any sentence with the word “you.” Perhaps, watch the video together. If you watch the video, it’s me explaining the agreements, not you, and this can make them more acceptable. Once you have both decided to work toward the agreements, I suggest that you decide upon a signal that either of you can use to let the other person know that you feel that they are violating one of the agreements. I recommend a nonverbal hand signal such as the time out signal used by sports teams. If you see the signal, you should stop talking and consider whether you have violated an agreement or not. You can even ask for clarification, but never let the agreement become the basis for an argument about whether an agreement has been violated or not. If you argue about the agreements, you are breaking them and defeating their purpose. Remember that there are almost always two different perceptions of a situation. Using an agreed upon signal will stop negative destructive cycles from beginning. We’ve all been in a cycle where one thing said causes another and causes another and causes another – and before you know it safety has been destroyed and a relationship damaged. Using and honoring a hand signal will refocus you on the agreement you have made and keep things from getting out of hand. Decide upon your signal, then download, review, and sign the agreement. Of course, you don’t have to sign it for it to work, but there’s something very powerful about setting your intention, sitting down and reviewing the agreement, agreeing between yourselves that you are going to do these ten things, setting a signal, and then signing a written agreement. Set your intention, expect the best – and enjoy the intimacy that follows.